I purchased a LG420G Tracfone and downloaded the Quick Start Guide. I had no problems until I got to the ringtones. I cannot find a way in the guide to play the ringtones so I can decide on which one to use. Also, I have a problem when I try to repeat a letter when I type in a name for contacts, for instance: Anne Ingram. I type in A,n, and then when I try to type another n, I get m. How do you repeat letters when typing in a name? My last question is how do I save items such as names, phone numbers, etc for the contact list? Thanks for your questions. I'll go through them one by one. Let's assume you have the Normal Profile active with a red check mark next to it. Highlight the Normal profile using the Up or Down nav keys and select Options -> Edit. The voice ringtone should be highlighted. 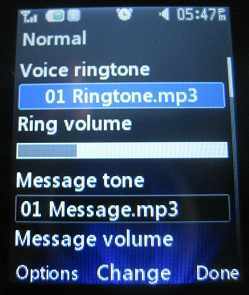 To hear how the current ringtone sounds, hit the Down nav key to select the ring volume setting. Now the ringtone should start to play at the selected volume. You can adjust the volume with the Left and Right nav keys. 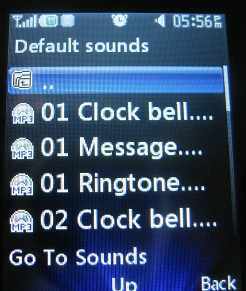 To change the ringtone, use the Up nav key to highlight the ringtone itself (such as 01 Ringtone.mp3) and select the center nav key. This will bring up the Sounds menu when you can choose from Default sounds, Ringtone, and Voice recordings. Highlight Default sounds and select Open to see a list of the default sound. Initially the ".." selection is highlighted, but as you scroll down through the list, if you just wait a second, the ringtones should play automatically, and you should be able to hear them. If the volume is too low, you can use the side up and down buttons to adjust the volume or wait until you get back to the previous menu. Once you hear a ringtone you like, use the center nav key to Insert the ringtone and it should now be displayed as the voice ringtone on the screen for the Normal Sound Profile. Select Done, and you should be all set. You can similarly edit the other tones for message, and other sounds. First, you should make sure you're not in "predictive text" mode which attempts to guess what you want to type. To check this, start composing a text message and then click "Options" and scroll down to select "Input method" and make sure T9 is NOT checked. As long as it's not checked, I think you just have to wait a little when the next letter is on the same button. So when typing "Anne", after you type the "A" and start pressing a different button, the phone can tell that you're done with the first letter. However, when you type "N" by pressing the "6" key twice, you have to wait a second (maybe half a second) before you press the same button again twice so that the phone knows that you're done selecting the "N" and are now entering the next letter. I'm sure what you mean here. You save phone numbers etc in the Contacts. Go to Menu -> Contact and select New Contact to save the First and Last Name and Mobile phone number. Select the Options -> Add Detail to save additional info such as email address, an image birthday etc. You can also select a particular ringtone for that person so that you can know who's calling when you hear the ringtone you've associated with them in the contact list. Your answers were right on the money and I appreciate your help to access the ringtones and enter contact data. After reading your comments, I had no problem entering the data I needed to enter. Thanks again for your help. This is an excellent site.